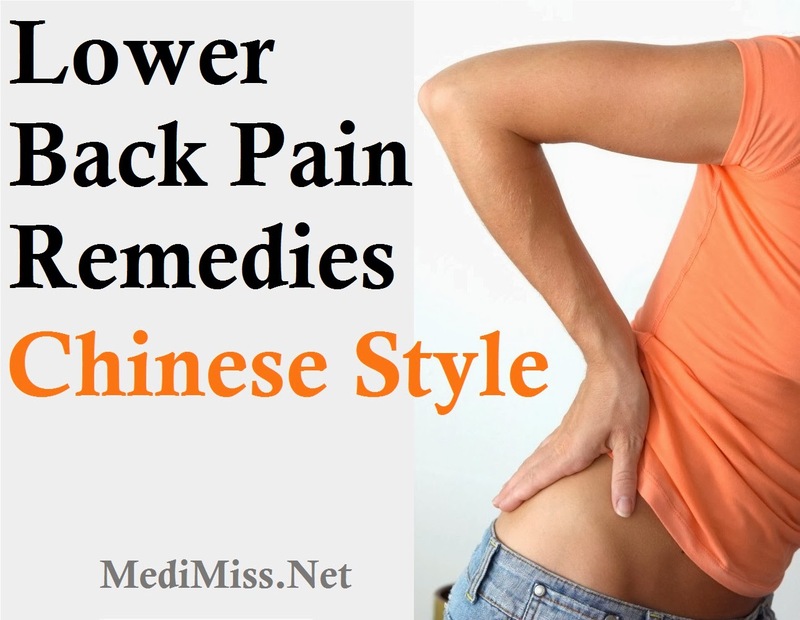 Traditional Chinese Medicine (TCM), with its 2500 year old history, offers many lower back pain remedies - lower back stretches and strengthening exercises, massage techniques, acupuncture, herbal remedies, liniments, sticking plasters and others. Some require a trained TCM practitioner to administer them, while others can be easily learned andapplied by anyone. This article introduces some effective low back pain remedies and stretches that you can apply yourself to relieve and prevent low back pain. Breath slowly, smoothly and deeply through your nose while doing the exercises. Exercise 1. Lie on your back on a firm bed or the floor. Gently bring your knees up until they're above your abdominal area. Spread your knees a little and grab the inside of your shins just below your knees, or the inside of your ankles if you can. Inhale. As you exhale let your knees naturally fall further out to the side with gravity. Focus your mind on your back (closing your eyes helps). Feel your inner thighs stretching and your back relaxing. Hold the position for a few minutes as you continue to breath slowly, smoothly and deeply. This exercise stretches and relaxes your iliopsoas muscle which connects from your lumbar vertebrae to the inside of your hip joints. Tension in this muscle often causes and/or aggravates low back pain. Exercise 2. Lean across a table and grab the far edge with both hands. Your torso should be on the table and your legs hanging from the edge. Inhale. As you exhale, let gravity naturally pull your legs down towards the floor. Feel your back stretching. Hold the position for several minutes as you continue slow, deep breathing. Focus your mind on your back (closing your eyes helps) and imagine the pain releasing with each exhalation. Repeat several times a day. Mix together equal parts of pure sesame oil and the juice from grated ginger. Heat in a pot till warm. Apply a small amount to the painful area and rub it in for a couple of minutes. It should be applied to unbroken skin only. Ginger and sesame oil liniment is a superb, easy-to-make, home remedy for back ache and other aches and pains. It warms, circulates your blood and stops pain. You can safely apply it several times a day, particularly after showering and before bed. Make sure you pull your clothing down over your back immediately after to keep the area warm. Also, while it's normal for your skin to become hot and turn red after you apply the liniment, if a rash develops discontinue use. Can be done standing or sitting. With fists clenched (not too tightly), use the backs of your hands, including your knuckles, to vigorously rub your lower back up and down for several minutes, 3 or 4 times a day. Rub close to your spine and also the sides of your back - where ever you experience pain and stiffness. Self-massage is a highly beneficial low back pain remedy you can do anytime, anywhere to relieve and prevent low back pain. Massage warms the area, moves the blood and directly stimulates your kidneys, which helps to maintain a strong, healthy lower back. Tip: To greatly enhance the effects of the above lower back pain remedies and lower back stretches, combine them. 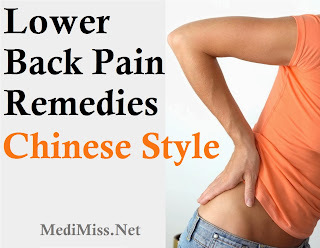 For example, lie down and do the first 2 stretches, then stand up and do the lower back self-massage, then apply some Ginger & Sesame Oil Liniment. You know your body best though, so experiment till you find what works best for your particular situation.